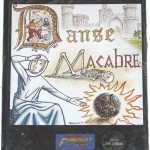 Danse Macabre is a french game that was rumoured to have been released back in 1986 by Funlight Software. 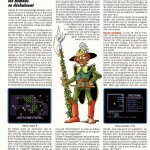 There is a wiki article talking about the game, and rumours that someone from a French Atari forum saw the game running on a Commodore 64 a long time ago. 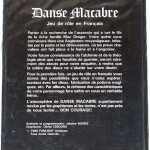 An advert was found from 1986 in a French game magazine (TILT), and stated that it was for sale. 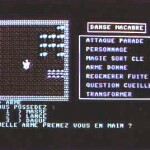 Florent Fontain (as well as originally telling us about this game), has located the TILT scans, which also included a quick writeup about the game (Currently in French – can anyone translate?) 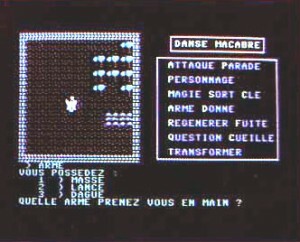 and a C64 based screenshot which you can see below. It looks very much like it may have been written in BASIC, but we are not sure. It uses the standard C64 font. The advert scan can also be viewed here. As a result of confirmation of the game existing and its release, I am going to close the case for this one, as it is a released game. We hope in future that it will get an English translation. 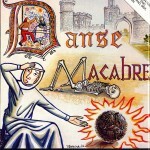 I did play this game when I was young… so rare that I found it fairly recently !